Elizabeth Berrien describes her career, in fact her life, as an exploration of possibilities. She has always faced challenges as opportunities for discovery and has embraced a life of creative problem solving. As a high school art student in 1960s San Leandro, CA she found herself frustrated with most art media such as paint and clay. She credits her teacher at the time with introducing her to wire. Rather than asking her to be derivative of artists such as Alexander Calder and Ruth Osawa who had popularized their own brands of wire art, he asked her to be creative. Finding her inspiration in nature, Elizabeth went to work, and finally found a medium that resonated with her. Through the process of trial and error she hit her stride and has continued to grow, learn and challenge herself both as an artist and human being. 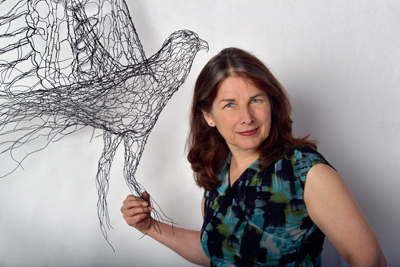 Her most recent work melds her unique wire sculpture with technology and science. Having just completed work for a CGI enhanced Hyundai car ad, she is continuing to break new ground with her collaboration in a scientific project whose goal it is to develop a fiberoptic fabric that can change its shape according to external stimulus. For more information about Elizabeth Berrien, to view her art, projects and awards go to her website www.wirelady.com. To download the show go to the Entries RSS option under the META menu at right.